Special thanks to all who entered and all who gave their feedback in the preliminary round. What a great contest our 2019 Winter Writing Contest is. We’ve had wonderful entries—a considerable number which received double-digit thumbs up! Now it’s time to announce our finalists! Just a reminder. This is NOT a popularity contest. We really do want to acknowledge writers who have honed their skills and demonstrated their ability in this little exercise. So, those who vote in the poll, please be sure you read all three of the finalist entries and give a fair assessment. Special thanks to all who entered and all who gave their feedback in the preliminary round. We had some that came so close to making the finals—it was hard for me to follow the rules for the contest and include only three in this poll. We’ve also had a number of excellent, helpful comments, so hopefully you all who entered gained some insight into your writing. 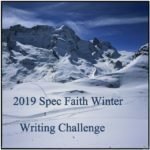 I hope the challenge has encouraged and inspired all the writers. All that’s left is to select the winner, and that’s also in the hands of our visitors. Choose from these finalists and vote in the poll at the end of this post for the one entry you think is best. Voting will last until midnight (Pacific time), Sunday, February 10. That’s precisely why I told him my intentions. It worked! Lisette heard my final words, our predetermined cue. A small section of the floor molding rose, on the far side of the display room, revealing the narrow passageway. A mechanic’s creeper then glided out on well-oiled casters. I unsteadily pointed at my target: the telluric electronal harvester, humming quietly behind the guard. It burnished bright with newly manufactured metallic curves and subtle, decorative illuminations. Naturally, it levitated, needlessly; my brother was ostentatious with “his” inventions as they were display at our annual Von Barger Estate Fair. Lisette—my blessed, willing, diminutive, long-suffering, task-runner—slid out from the darkness of the hidden room. Brother’s architectural cleverness was my opportunity. “You d’serve a dance, my friend!” I announced to the guard, and ersatz step shook my limbs. Lisette lithely slid onto the creeper and wheeled underneath the harvester, deactivated the correct section of casing to reveal the electronal hopper and its wiring, quickly sketched out my proprietary schematics, and slid back into the passageway in just under a minute. I belched, produced a silver ducat from my pockets, and flipped it over to the guard. It fell lamely onto the carpet in front of him. I doffed my hat and left down the hall, among the other fair-goers. By this time tomorrow, the other Von Barger son will receive a very obnoxious series of tele-scripts and sketches that revealed my successful little reconnaissance and recovery mission. Our little prank war continues! I glanced at the hallway behind me. The research wing of the Library of Congress wasn’t as pretty as the reading room. I smiled and opened my backpack. “Check-in is on the left,” he said, poking in my bag with a plastic baton. “Sign in and leave your ID. You’ll have to throw that out.” He pointed at the box of cheese crackers. “I just bought it!” I whined. The receptionist at check-in was barely paying attention. I handed her the fake ID, deposited my backpack in the locker, and sat in the cubicle with the only blind spot in the room. The flattened cracker box concealed in my hoodie poked my ribs. The book came protected in a white archival box. It was smaller than I expected. I caught my breath as I opened it with white-gloved hands. Despite its size, it felt heavy, as if history added weight to its pages. I could barely believe I held the diary of the daughter of the most famous psychologist in history. She had written her name on the inside cover in spidery ink: Anna Freud. I turned the fragile pages to the day I was looking for. It was blank but for one phrase. I couldn’t believe I was holding what the Gestapo were so desperate to find. The diary fit perfectly in the cracker box. The receptionist was clearly woozy from handling my ID card and handed me my backpack without a word. She would be snoring in moments. The ancient bottle of reagent was waiting in my hotel room to reveal what was inscribed on the rest of that blank page. Now I had to make it out the door. It’s kinda bothering me that I can think of better ways to dodge airport security than that first one. Like, don’t act defiant. Act clueless instead. Mask its presence by carrying other materials in that language. You ARE trying to learn the language of the place you’re missionary-ing to, right? A bilingual dictionary, kids’ books, a Koran, the poetry of Bai Juyi, magazines, whatever. Chances are better that they do not give a crap about the personal books of a foreigner. If it keeps you out of prison, let them chuck it in the trash. The great thing about printing presses is that you can make more books. But really, there are cheaper ways to get that kind of thrill. Like carrying a regular sized shampoo in your bag in an American airport. I’m doing a little happy dance over here! Thank you to everyone who liked my little story. Good luck, Sarah and Jay! I liked yours best out of the first round, and that includes mine! Haha. Such a great set of hooks there. Some of them were set with just a handful of words, too. Well done, very well done. Blessings, Jay and McCary. Good work, both of you. Thanks, L.G. McCary! I liked your story a lot. I read all three stories and Laura, I truly loved your story the best( you probably don’t remember me, I am a lifelong friend of you Daddy and long time friend of you Mum’s. I live in Maine now and haven’t seen you since you were about 5 or 6! I keep up with you through your parents posts about you! Even though I have a sweet connection with you, I truly liked you story the best!! Good Luck!